Are you caring for your parents who are over the age of 65 and struggling to access routine dental care? Dr. Alisa Kauffman provides dentistry for aged parents Manhattan can rely on. As your parents age, they become more susceptible to conditions that impact not only their teeth but their overall health. When dentistry for aged parents in NYC visits your parent, they not only checks for cavities but conduct an oral cancer screening. Oral cancer screening is imperative since more than 40,000 seniors are diagnosed yearly. Dentistry for aging parents in Manhattan presents the American Dental Association’s top 4 oral cancer risks for seniors. Men are twice as likely as women to get oral cancer. The American Cancer Society attributes this to the increased rates of alcohol and tobacco consumption. Whether your parents chew or smoke it, tobacco use dramatically increases the probability of contracting oral cancer. Poor nutrition can also put your parents at risk for developing oral cancer. It’s essential for aging adults to eat fruits and vegetables daily to lower the risk. Sunlight. If your parents spent most of their life working outside in the sun, they are more prone to getting lip cancer. Access to dental care for seniors can become increasingly difficult when they have multiple health conditions, they are bed bound or have limited mobility. Dr. Alisa Kauffman provides convenient and compassionate dentistry for aged parents Manhattan needs in the comfort of your parent’s home or apartment. 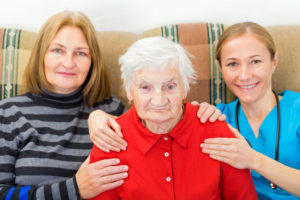 We are dedicated to providing high quality dentistry for aging parents in NYC, and will coordinate care with your parent’s primary care providers or home health care aide before starting any treatment or prescribing medications. If you’re interested in learning more about dentistry for aged parents Manhattan trusts, please call us at (917) 826-6278 or schedule an appointment today.